Equipped with all of the standard Elite One battery-operated features, the Elite Two's advanced triple oscillation takes match play to the next level at a minimal cost increase over the Elite One. While almost all machines sweep randomly left to right horizontally, the Elite Two also oscillates vertically, giving you short and deep shots in a random pattern to provide a better physical workout. Or choose your shot placement vertically only and horizontally only. Want more action? Simulate match play by combining both vertical and horizontal oscillation functions to throw balls throughout the entire court-left, right, short, and deep. 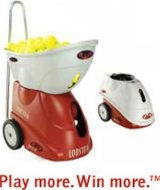 This tennis ball machine will challenge all of your strokes, not just your forehand and backhand. You'll also improve your reaction time while you advance your foot speed agility. In addition to triple oscillation, the Elite Two will confront you with up to 50 degree lobs to practice your overheads - a feature not available on any other ball machine, speeds of up to 80 miles per hour to challenge your ability to react with thinking, and heavy top and back spin choices to perfect your ability to return whatever comes your way. While almost all machines sweep randomly left to right, the Elite Model 2 simulates match play with left, right, short, and deep shots in a random pattern. Designed for maximum durability, its 44-pound ergonomic design and oversized-wheels allow for easy transport, even with a full hopper of 150 balls. A 4- to 8-hour battery helps ensure plenty of court time between recharges. If you think your game could benefit from upping the oscillation features to include a narrow and wide two-line drill feature, find out more about our premium Elite Three model. Take me to the features-at-a-glance chart so I can easily compare all three Elite models. Take me to the features-at-a-glance chart so I can easily compare all Elite models.